Built:	1961	by	Dixons	of	Exmouth. Complete	restoration	by	Traditional	Sail. Built:	1959	by	Morgan	Giles	Ltd.
Teak	hull	on	oak	frames. 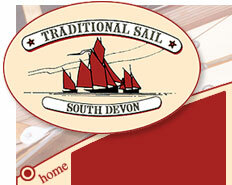 New teak laid decks by Traditional Sail 2002. Classic boats are admired and desired throughout the world. Whether a sailing or motor yacht, ten foot or a hundred foot, they are living pieces of history which will turn heads wherever they go. Many people believe that the cost of owning a classic boat is expensive, but those who own one soon realise that a well maintained wooden boat will generally retain its value because they become rarer and more unique as the years go by. 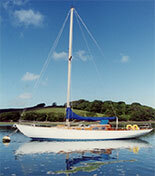 For example, a classic yacht of about 40' should cost in the region of £65,000 in good condition. Over a five year period maintenance will be in the region of 10% of her value each year. 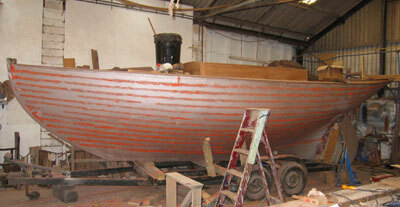 This will ensure the value of the boat continues to rise and her condition maintained. 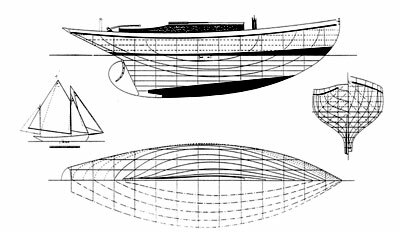 A modern GRP yacht of similar size and quality will cost at least £100,000 and maintenance per annum would be about £2,000 to keep her looking good, but in all probability her value will fall like a new car as designs become dated and desirability reduces. Therefore the maintenance of a wooden boat is easily offset by its retained re-sale value and the reduced cost of purchase. 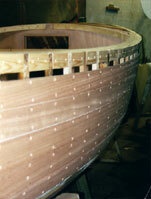 All wooden boats require regular and proper maintenance to avoid deterioration and loss of value. Rot and corrosion are continuous processes and their effects can threaten the future of a wooden boat. Postponement of maintenance can result in a minor problem becoming an expensive repair. Leaking decks and deckhouses are of major significance. Fresh water is far more damaging to timber than salt water and rot can establish in hidden areas and spread dramatically. Corrosion of steel floors and adjacent fixings can be a cause of major expense. It is far cheaper to re-galvanise steel works regularly rather than to wait until planking and structural timbers are affected by electrolysis. La Bonne, 1919 Harrison Butler, LOA 27,81'. Built by H Gale & Son. Pitch Pine on oak. Currently undergoing complete restoration, including gaff rig. Come	back	often	and	follow	her	transformation. Maintenance of paint and varnish finishes not only give the pleasure of a smart and tidy boat but ensures that wood is protected and small defects are dealt with before major deterioration sets in. 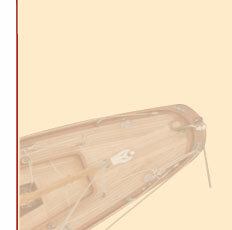 We have drawn up some proposals for maintenance of wooden boats. A full maintenance regime together with anticipated costs can be assessed for each boat. This should enable an owner to anticipate expenditure over a long period and appreciate the benefits of ownership.